Gore settings promises to let players “experience the real horrors of WW1,” which I rather strongly suspect is neither an accurate statement nor something that any sane person would ever want to live through in the name of entertainment. But to the credit of developers M2H and Blackmill Games, they do seem to be approaching the subject matter a little more sensitively than, say, Sniper Elite 4. 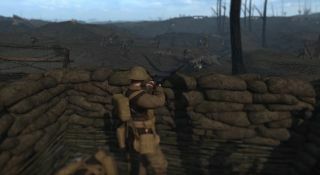 The update also adds a Belgian sentry squad, a Doughboys rifle squad, and a US Marines engineer squad to the game, along with two new German units, the Schutzen sentry squad and the Pioniere engineer squad. New weapons include the M1918 BAR, the Stielhandgranate, the Ross rifle (which you'll probably want to throw away the moment you lay eyes on a Lee-Enfield) and the C96 Mauser. The Horrors of War update is live now. Details are on Steam.